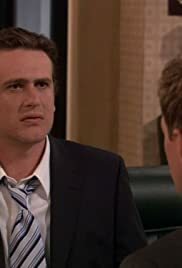 Marshall cries in front of his boss after he chews him out, and everybody gives Marshall their own unique advice on how to confront his boss about the situation. Barney Stinson: Shotgun for eternity! Robin Scherbatsky: You can't call shotgun for eternity. Barney Stinson: I just called it. Robin Scherbatsky: You can't just call things! Barney Stinson: I call that I can call things! After so many great episodes, it was inevitable that there would be a drop in quality somewhere and this was it. Plot In A Paragraph: Marshall cries after being shouted at by his boss, so the other four all tell him how he should deal with it. Robin suggests he go in with a gun, Ted Suggests he gives a speech about how he will not tolerate being abused, Lily suggests using the same approach she takes with her kids at school and Barney suggests he just send the abuse further down the chain of screaming (or the circle of screaming, or the pyramid of screaming) and simply scream at someone beneath him. Whilst this episodes has it's moments, there was not many laugh out loud moments to enjoy for me.